The Economic and Financial Affairs Council (ECOFIN) has formally adopted the recommendation to appoint Central Bank Governor Philip Lane for a position on the executive board of the European Central Bank. The matter was discussed by Ministers at Eurogroup yesterday and ECOFIN agreed their recommendation to the European Council earlier today. Professor Lane was the only candidate to replace the ECB's chief economist Peter Praet, whose terms ends on May 31. He is also Ireland's first representative on the executive board of the European Central Bank. Finance Minister Paschal Donohoe said he was pleased that his colleagues at Eurogroup and ECOFIN supported Governor Lane for the position of chief economist at the ECB. "This is an important next step in the process, and I am looking forward to the European Parliament and the European Central Bank delivering their opinions on Professor Lane's candidacy, in advance of the European Council next month," the Minister said. "Philip is a remarkably well qualified candidate and I am confident he would step up to the challenging post if appointed," he added. The European Parliament and European Central Bank will now deliver opinions on the recommendation with the final consideration scheduled for the European Council on March 21. If approved, Professor Lane will take up his new post on June 1. 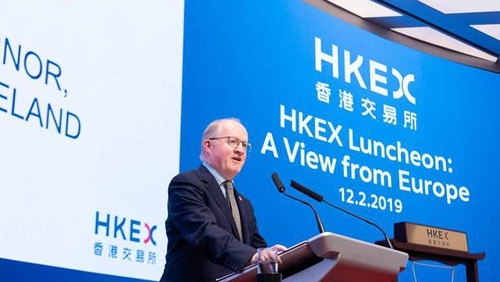 Philip Lane today addressed a gathering at the Hong Kong stock exchange, and will attend the European Financial Forum event organised by the Financial Times in Dublin tomorrow. The Harvard-trained economist is no stranger to the realm of global finance, regularly attending events such as the International Monetary Fund meetings. But since he emerged as a candidate for promotion, Lane has gradually raised his number of public appearances - especially across Europe - according to a tally provided to Bloomberg by the Central Bank. Bloomberg said that in 2018 he delivered 20 official public speeches in at least seven different countries. Meanwhile, Bloomberg has reported that Sharon Donnery is set to succeed Philip Lane as Central Bank Governor when he leaves for the job at the ECB. Sharon Donnery, currently Deputy Governor for Central Banking, is the bookies' favourite to get the job and would be the first woman to lead the Central Bank. Bloomberg said that other potential candidates include Derek Moran from the Department of Finance and economist Alan Ahearne. Law professor Niamh Moloney is also among the runners, as it John McCarthy, chief economist at the Finance Department and Paul Ryan, head of the international finance division at the Department.